Trying to find things to do can sometimes be difficult when there are so many choices. We've put together some sample itineraries based on your own travel style to get you started. Looking for excitement in the Missoula-land area, but not sure what exactly it is around here that will get the blood moving and the heart pumping? It all depends on the season, but we'll find a way that will get you out and about, because there really is no way to explore an area quite like throwing yourself full-throttle at every possibility that lands even remotely close to your lap. Missoula offers access for skiers and snowboarders at our local ski hill Missoula Snowbowl, or easy access to Discovery Ski Area south of town. If the snow is on the ground, cross country skiing will also get the bones moving while managing to not be overly adrenaline rushed. Don't fancy the downhill adventure, but want to get out in the mountain none-the-less? Hiking is another great option for the outdoor enthusiast which also offers access for mountain bikers, and camping, or even snowmobiling around our many forests and mountains. In the summer time there are many options offered by all sorts of outfitters for rafting or kayaking and canoeing. However, if your flavor of adventure is more serene, we suggest looking into the local fishing options, ice-fishing, our day trips, or possibly a simple walk in the woods with some disc golf(frisbee golf). Family trips can be fun. They can also be trying when it comes to pleasing all those different interests, wants and "want-nots." Missoula will keep the whole family busy, no matter the taste or preference for what to do. The biggest benefit of trying to please many people while in Missoula is that we are not a very large town overall. You would be hard pressed to spend more than 20 minutes in the car getting across town, even if you didn't know where you were going and had no map! That isn't to say that we have nothing to do though, far from it in fact. For the young ones (and even those well into their teens and above) Missoula's Caras Park offers A Carousel for Missoula. A large wooden carousel hand built by a local carpenter and many generous donors of money, time and skill. Next door to the carousel for the littlest of ones is Dragon Hollow, a large wooden castle-like playground within sight of the Clark Fork River running westward through town. The Children's Museum, SpectrUM, and many of the local city parks scattered around town give the family plenty to do while getting some movement too! If the heat is getting your family down while in town, then head over to Currents and Splash Montana, or get out into the mountains and take the family hiking in one of our many surrounding forests. However, if adventure is more in your family's mind, then consider looking into opportunities with gold and gem mining, or skiing and snowboarding at our local Missoula Snowbowl. If that doesn't quite fit, then consider ice skating at the local Mauler's Arena at the County Fairgrounds or in one of the city parks, followed up with a relaxing sleigh ride. Missoula is a place of peace and relaxation for those who are looking for it. It all depends on what exactly constitutes a "peaceful" experience for each person on the prowl. From simply sitting in a coffee shop and watching the snow come down outside while sipping on some hot coffee or tea to soaking in a mineral bath at one of the local spas, Missoula is here to cater to your desires. In and around Missoula one can find a multitude of spas that will keep you from having to drive clear across town (only 20-ish minutes, but who needs that when what you want is relaxation?). 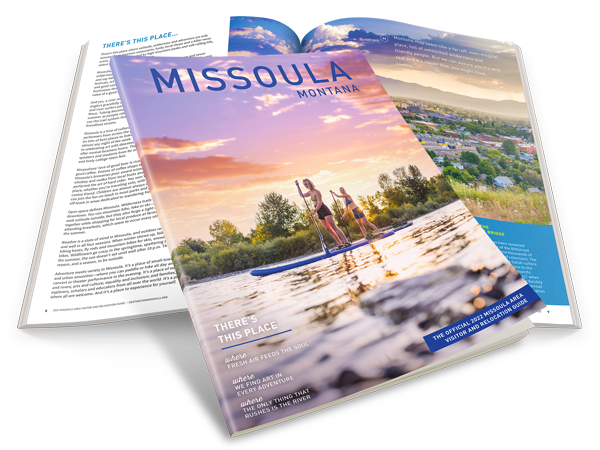 For those with a little more adventurous spirit you can either find yourself a Hot Springs of Montana guide book, or simply visit one of the commercial hot springs surrounding the Missoula area. For some, a simple drive through our beautiful scenery is all that may be required to settle the pulse, and if this is the case a visit to our day trips page is in certainly in order. But maybe, just maybe only driving won't do it. You're going to be difficult, huh? Okay, we can work this out. How about some bird watching, cross country skiing, hiking, or canoeing. If none of this works for you and if the weather is warm, we suggest going tubing. Head up toward East Missoula and enjoy the relaxing ride as the Clark Fork slowly brings you back to town. You may be in the west, and you may believe that all we have out here are cowboys and the remnants of prospectors' houses long abandoned. While you may be mostly correct, the west has managed to scrounge up quite a bit of cultural activity secluded out here far from the business center of America in the east. If you'd like to find out what exactly was going on in Missoula's early days, a visit over to the Historical Museum at Fort Missoula may be in order. A visit to the University of Montana campus is also well worth your while for some historical background of Missoula's continuing dedication to higher education. While you're wandering around town you might want to consider taking a historic walking tour or head to the north end of Higgins St (that's downtown to the locals) during the summer months on a Saturday morning to catch a farmers market for some locally grown grub. In and around the downtown area are also a collection of museums and galleries. Make sure you are around for First Friday every month when the galleries are open late, serving wine and the town is out on foot. Out and about in the surrounding Missoula region you can look into some of Montana's ghost towns. For a guaranteed good time, you can look into one of Missoula's many coming events or annual events.